Sure to please any traveler, the Villagio Hotel Boutique is proud to offer outstanding service and superior accommodations. With the Italian Spirit dedicated to you, the Hotel Villagio distinguishes from others. This modern Boutique Hotel will satisfy all of your needs. Based on his culture and spirit, the personalized attention is understood and carried out in an efficient, punctual and dedicated way. 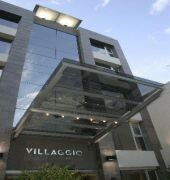 The Hotel Villagio is characterized by its design, architecture, functionality and personal attention so that they achieve a unique relationship with its customers. The architectural lines of the hotel are entrusted to the work of the recognized furniture and cabinet maker Petrios Ebanistas, who assembled the setting for great functionality and design. The Lounge of the Hotel Villagio has a magnificent own winery and a menu based on the traditional Italian food. After a long day you may enjoy exquisite drinks and cocktails in its bar while surfing online on one of the 3 Computers. The spa invites you to relax and enjoy an unsurpassable sight of the city and the Andes Mountains. For guest travelling on business, the Hotel Villagio offers a small and a large Business Center with capacity for 60 people and salon especially designed with an imperial table for 10 people.